Lord Triphian I was elected by the Noble's Voice, a voting committee of all Lenfald Nobles, as a successor for the recently deceased High Lord Wensesclaus II. 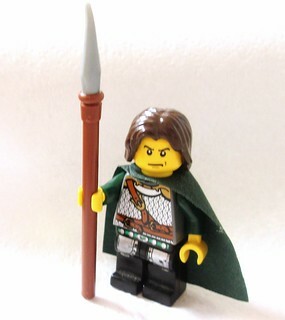 Triphian, who's original pre-coronation name was Sir Tripp of Lenfald, quickly gained many followers amongst both peasantry and nobility, when he used his extensive riches to construct several monuments to the fallen Lenfel after the devastating Civil War. LC1~Fortify the Forest challenge winner... Albatross_Viking's Watchtower. LC4~ Lenfald Tax winner...Friskywhisker's Pay Up! Last edited by friskywhiskers on Tue Mar 11, 2014 11:34 pm, edited 54 times in total. 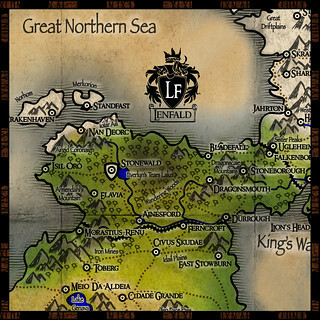 Ok guys here it is, the new and updated Lenfald thread. I'd like to get a few things straight, just so you'll understand how I'm gonna run things. Now if you don't have any possibility whatsoever adding yellow to your banner, I'd rather you'd use just a Dark Green flag than a Dark Green and Pearl Golden one. The Pearl Gold flags are for Loreos as we agreed when we started the LCC. Thanks for all your hard work Elderon, Lenfald looks like it's shaping up quite nicely. By the way, I sent you a PM with somewhat of a rough draft of an idea for our next LC. Last edited by friskywhiskers on Fri Jun 07, 2013 2:02 am, edited 1 time in total. Is a double green banner ok? Well everything is shaping up very nicely! Being uber jealous of the cool banners some of the opposing faction have designed, I too have created one. Any one who participated in one or both phases of the GC3 may include it in their signature. Just click on the image, and copy and paste the url into your signature edit box on the user control panel. Last edited by friskywhiskers on Thu Mar 07, 2013 4:05 am, edited 1 time in total. Oooh, well done on the banner. And friskywhiskers, thanks for the Champion image, great stuff! Cheers, For Great Lenfald! Last edited by Caelan on Thu Mar 07, 2013 4:38 pm, edited 1 time in total. Proud to be a member of great Lenfald! I enjoy this tremendously and have very grateful for the smooth transition to our FO and FL. Great work Elderon, Frisky. I'll be checking in as a regular member sometimes, but not often anymore. It seems that Elderon is ready and set to get going with his work as Lenfald FO. I just wanted to say that I am very proud of all of you, not only for winning the GC3, but also for making me have such a great time. Lenfald was, and will probably be, a big part of my life, as will the rest of the LCC. Now, I can only wish Elderon and Friskywhiskers good luck. This is great guys! Great job Sir Edwyn with the banner! Yeah, that banner is really cool ! And thanks for updating the scores and getting Lenfald back to track !